Well, it’s almost the end of January and we’re starting to see some of our new initiatives take shape. I’m super excited to share one of those initiatives with you, which is our new window clings for Chamber members to display at their business! I’m sure you’ve seen old ones around town, they look shabby and sun drenched (some even say Alliance for Amesbury, our predecessor). 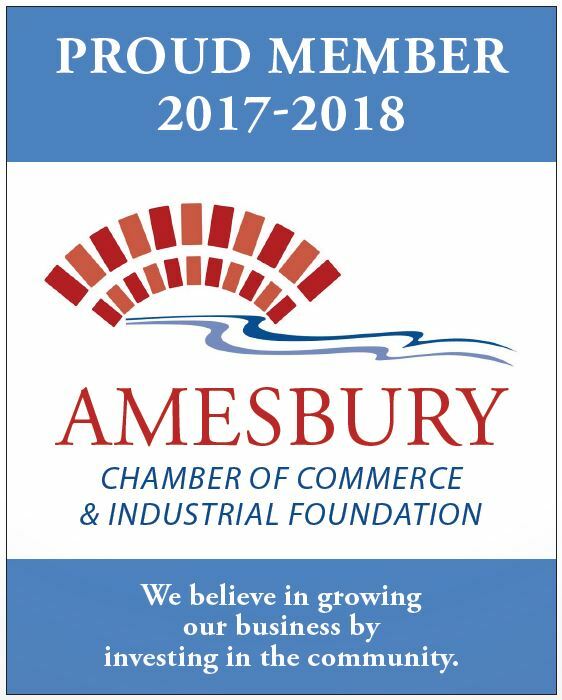 We want to make sure that Amesbury residents know who our Members are. We highly encourage you to choose Chamber Members whenever you need something. Why choose a Chamber Member? There are lots of reasons to choose a Chamber Member! If a business has maintained membership in the Chamber of Commerce they have chosen to financially invest in the future of our community. As a group they make it possible for us to address concerns with business regulations and zoning, offer education and leadership programs, as well as impact the quality of life in Amesbury and economic growth. Chamber Members often further invest in community events with sponsorships and gifts. These businesses help fund our scholarships for AHS students and frequently are found to be charitable to other local organizations. Chamber member businesses are reputable and care about their company, employees, and customers. Studies show that consumers favor Chamber businesses. That only works if people know who the Chamber Members are. Therefore, we bring you new window clings and an easy-to-navigate business directory! Next time you (or someone you know) need something locally, choose a Chamber Member! (And tell them we sent you!) Members will receive a new cling when they renew their membership. We have also recently updated our website and changed the categories in our Business Directory to make searching for a business more intuitive. Not sure which businesses are Chamber Members? It’s easy! Just look for our logo in their window, or search our Business Directory (bookmark it for easy access). You can also read about some of our successful businesses and their Success Stories.